Optigreen’s Stefan Zeller discusses the last ten years of green roofing the UK and where he sees the future of the market. It is now ten years since Optigreen/ Optigruen International AG became involved in the UK green roof market having already had over 30 years of roof greening experience in Europe. Over this time the roof greening industry in the UK has grown significantly and green roofs are now much more commonly specified mainly on new build projects, and also to a certain extent on building refurbishments. So will this development continue over the next ten years and if so in what way? The indications are that it will and that green roofs will become a more mainstream part of a typical roof specification in the future. This will be driven by the need for greater ecological mitigation on new development sites, stricter water attenuation requirements in light of climate change and the need for more green space in built up areas. So what challenges will this future growth present and what opportunities does it provide? Let’s have a look at a few key considerations. 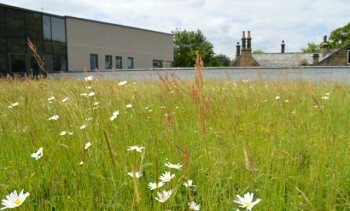 A large number of products for green roof applications have been launched in the UK in the past ten years. Some of these are very good whilst others, which are probably fine in others forms of horticulture, are not as part of a green roof where plants are expected to thrive in minimal build-up depths on the most exposed part of a building i.e the roof. The continued move to a greater diversity of specifications in the future will require tried and tested systems rather than individual products. Green roofs are also being increasingly used to address particular issues, such as water attenuation, where an engineered solution is often required. For example, Optigreen has been involved with a roof refurbishment project at the Victoria Shopping Centre in Nottingham where shallow sedum roof areas are replacing the existing deep planters. Using our retention solution the water attenuation performance of the original planters is being exceeded and will permanently relieve pressure on the centre’s drainage system. My advice to specifiers and contractors is to ensure that when it comes to green roof products you select a tried and tested system rather than individual products and a specialist supplier that can provide full technical support. Contrary to popular belief, it’s not necessary for the green roof system to be supplied by the waterproofing manufacturer. However, it is important for the waterproofing to be compatible with a green roof specification and to, ideally, be root resistant. Ten years ago the main source of independent information in terms of green roof specification and installation was the German FLL Guidelines and this is still an important document in our industry today. Subsequently, the Green Roof Organisation (GRO) was established as a partnership of manufacturers and stakeholders to develop guidance for specification, design, manufacturing, installation and maintenance of Green Roofs. GRO launched the “Green Roof Code of Best Practice for the UK” in 2011 and a new more comprehensive code was launched in 2014. This provides clear and vital information to anyone involved with specifying or installing a green roof. In other European green roof markets the supply and installation of green roofs is a separate trade to roof waterproofing. As a result of this green roof contractors have developed the skills necessary to provide an efficient, high quality installation service and have also played their part in developing some of the decent products that we now benefit from in the UK. In the UK, however, things are somewhat different. It has become common practice for the green roof to be part of the overall roofing package with the roofing contractor expected to supply and install it. Many roofing contractors have decided not to have their labour involved in “gardening” and have either declined to quote or have sub-contracted the green roof, often to a company they know very little about but who were cheap. However, as is often the case, you get what you pay for. The good news is that roofing contractors can be involved with the expanding green roof market in a more positive way in the future. Firstly the expertise and training is available through quality suppliers and manufacturers for them to become directly involved with the green roof element if they wish. For example, in 2012 Optigreen launched the first dedicated approved contractor scheme within the UK green roof market, called the Optigreen Partner Network, where as part of the benefits of the scheme company personnel receive training on products and estimating as well as installation techniques. This means that the supply and installation of extensive green roofs at least can now regularly be within the roofing contractor’s remit. The next ten years certainly promise to be an even more exciting time in the development of roof greening providing plenty of opportunities for those wanting to be involved in this newer sector of the roofing industry. If you have an editorial get in touch with us.